Now this is just too damned creepy for words. One of the best memorials I’ve seen or heard for the late jazz great Max Roach comes courtesy of Amy Goodman on Democracy Now. You owe it to yourself to watch Bill Cosby’s tribute to the phenomenal drummer, which manages to be hilarious and understatedly touching all at once. You also owe it to yourself to hear Amiri Baraka talking about his terror when he showed up with some pages of poetry for a word and music session only to be told by Roach that he would have to improvise, just like the musicians. In fact, you owe it to yourself to take in the whole thing. Lester Young (who was born on August 27, 1909) may be the only jazz musician who is arguably better known for a jazz tune about him — “Goodbye Pork Pie Hat,” composed by Charles Mingus in response to Young’s death in March 1959 — than for his own music. There’s a surprising amount of Pres available on YouTube, including this lovely interchange with Billie Holiday, this jam session recorded in 1944 (presumably filmed before Young was inducted into the Army, a nightmarish experience that all but ruined his life) and this featured spot during a 1939 performance with the Count Basie Orchestra. And, because there can never be too much Mingus music, here’s my favorite version of “Goodbye Pork Pie Hat,” played by bass master Dave Holland. 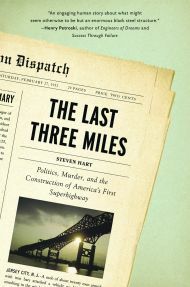 My book The Last Three Miles figures in today’s Star-Ledger piece about the fate of the Pulaski Skyway. Combined with the New York Times package that ran earlier this month, that’s some pretty good ink. Not a bad way to wake up on a Sunday. If you liked the climax of The Third Man, you’ll love these photos of the worlds beneath London, Manchester and Bristol. Arthur Miller’s reputation as the great moral conscience of middlebrow America never impressed me all that much. Chalk it up to getting hammered with Death of a Salesman in high school. Though he was supposed to represent The Common Man As Tragic Hero and the American Dream Gone Sour, Willy Loman always seemed like a delusional schizophrenic, and his thuggish sons nothing more than budding career criminals. Miller’s bizarre dialogue (“Nobody dast blame this man!”) didn’t help much, and what was supposed to be the crowning emotional moment (worshipful son ruined forever by discovery of Dad’s adultery!) was too pathetic to register as anything but low comedy. The play led to my first true Theater Experience, when I had a front row seat at the Circle in the Square for the revival starring George C. Scott as Willy Loman, but Scott’s larger-than-life style had the perverse effect of making Loman even less believable. Miller’s friends say they never understood exactly what happened with Daniel, but the few details they heard were disturbing. Miller had not only erased his son from the public record; he had also cut him out of his private life, institutionalizing him at birth, refusing to see him or speak about him, virtually abandoning him. The whole matter was “absolutely appalling,” says one of Miller’s friends, and yet everyone probably would have kept silent had it not been for the rumor that began to spread earlier this year, passing from Roxbury to New York City and back. Although no one was sure of the facts, the story was that Miller had died without leaving a will. Officials had gone looking for Miller’s heirs, and they had found Daniel. Then, the rumor went, the state of Connecticut had made Arthur Miller’s estate pay Daniel a full quarter of his father’s assets, an amount that was believed to be in the millions of dollars. For some of Miller’s friends, the possibility that Daniel had been given his fair share brought a measure of relief that, finally, a wrong had been righted. Attention had been paid. The feeling was shared by the social workers and disability-rights advocates who have known and cared for Daniel over the years as it became clear that he had indeed gotten a share of the Miller estate. “An extraordinary man,” “very beloved by a lot of people,” Daniel Miller, they say, is a “guy who’s made a difference in a lot of lives.” They also say he is someone who, considering the challenges of his life, has in his own way achieved as much as his father did. The way Arthur Miller treated him baffles some people and angers others. But the question asked by friends of the father and of the son is the same: How could a man who, in the words of one close friend of Miller’s, “had such a great world reputation for morality and pursuing justice do something like this”? If Arthur Miller had turned out to be a sterling character in every way, it wouldn’t raise my estimation of his work. But for people who have accepted Miller as a spokesman for the high road of morality and ethical behavior, this article is going to have a huge impact. My first newspaper job was on a small Middlesex County weekly, edited by a woman who shared, among other things, my fondness for Evelyn Waugh and his great journalism novel Scoop. It’s not his finest novel — that title goes to A Handful of Dust, one of the few books that made me gasp with shock as I read it — but the line “Boot of the Beast” will keep me chuckling well into my dotage. Anyway, the editor. After a while, our publisher felt the need to afflict the chain we were part of with an executive editor whose fancied himself a seasoned pro who would guide the fractious sprouts of the Somerset Press newspapers to greatness. Every week he would fax out a collection of his brainstorms, which were usually story ideas so wheezy that they collapsed with a gasp while being read. La Editrix and I would exchange glances, roll our eyes and say, “Up to a point, Lord Copper.” We may have been working on a pissant weekly in Central Nowheresville, N.J., but by crikey we were going to be its Algonquin Round Table, even if the nearest bar was the Sit’n’Bull Tavern and Dorothy Parker was nowhere to be seen. Bill’s mother wanted him to follow her brothers to Winchester; the headmaster of his private school counselled that Harrow would be the more appropriate choice. But after three unremarkable years at Harrow, which Bill did not greatly enjoy, the Wall Street Crash of 1929 finally shipwrecked his father’s finances, and brought his schooling to an abrupt halt. Bill’s uncle, Brigadier Sir Wyndham Deedes, came to the rescue, arranging three interviews for him, with Israel Sieff of Marks and Spencer, with Sir John Reith, the Director General of the BBC, and with Guy Pollock, the managing editor of The Morning Post. As chance had it, the ultra-conservative Morning Post proved to be the trump card. Deedes immediately showed his talent for journalism. By 1935 he had proved himself sufficiently as a reporter to be sent out to cover Mussolini’s imminent attack on Abyssinia. In Addis Ababa he discovered Evelyn Waugh, employed on the same mission by the Daily Mail. Waugh, already disenchanted with his own failure in this role, fell delightedly on Deedes’s luggage, which weighed a quarter of a ton, and included a cedar wood chest lined with zinc to repel ants, and all manner of equestrian equipment. (Deedes did not ride, a failing Waugh sought to rectify). The Morning Post’s correspondent also possessed three tropical outfits from Austin Reed. Since, however, Addis Ababa, 8,000 feet above sea level, was cold and damp, he was obliged to spend all his time wearing the tweed suit in which he had left London. Thus did William Boot, the protagonist of the novel Scoop, begin to take shape in Evelyn Waugh’s mind, which duly added to Boot’s effects some cleft sticks for sending messages by native runners. It is noteworthy, however, that William Boot finally triumphs as a journalist, almost in spite of himself. I should point out that my old newspaper’s office was on the shore of a rather pretty lake, and that in my more lit-snobby moods I was known to look out the window at the spatterdocks and intone, “Feather-footed through plashy fens goes the questing vole.” If you don’t know the joke, you owe it to yourself to track down a copy of Scoop and find out. The writer who once referred to the National Security Agency as “the puzzle palace” should turn his attention to Amazon.com and some of the features it puts on its book pages. Though I’ve been warned against paying attention to the Amazon sales rankings by my agent, my publicist and even a few editors, I find myself checking in once a day to see where The Last Three Miles has placed. I don’t have to tell you that my ranking isn’t going to cause J.K. Rowling any sleepless nights, but the rise and fall of my book does seem to correspond to — well, something. Today it’s back in the upper reaches of the five-digit club; some days it plummets into the six-digit level. Since the glacial pace of publishing means it will be weeks before I get hard numbers on how well the book is selling, these Amazon numbers have become as interesting to me as they are inscrutable. At this rate I’m going to be reading pigeon entrails. The other enigma is the Amazon categorization system. This morning, The Last Three Miles is listed in the “Mid-Atlantic” category, right behind Satan’s Circus by Mike Dash and just ahead of Peter Hamill’s love song to Manhattan. (In your face, Hamill! Boo-yah!) Not bad company. But it’s also listed under “Conspiracy Theories,” which is funny because the only theories touched upon in the book involve highway engineering. And the other books are a pretty mixed bag, too: Roswell flying-saucer tomes and titles that read like leftover chapters from the Illuminatus! 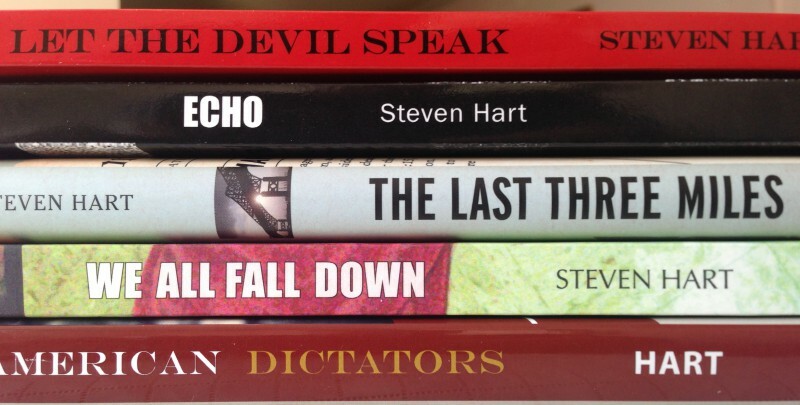 trilogy, alongside Steve Coll’s magnificent Ghost Wars and Shakespeare’s Julius Caesar. But any list that puts my book alongside Shakespeare is fine by me. Max Roach, who died today at the age of 83, could turn a set of drums into an orchestra. Jazz has plenty of drummers who are powerful, or subtle, or swinging, but few who combined those qualities as powerfully as Roach. He was probably the most sheerly musical percussionist I’ve ever heard, a verdict delivered by many of his colleagues. Charles Mingus, who had a stormy professional and personal relationship with Roach — they launched a groundbreaking artist-owned record label together, and recorded on some landmark records — once said that he came into a club performance during the middle of one of Roach’s solos, and correctly guessed the song being played simply by listening to Roach’s sophisticated soloing on the changes. Max Roach was a complete musician. Shortly after winning his MacArthur Foundation “genius grant” in 1988, Roach mounted a traveling showcase that took in every aspect of his career: his basic quartet work, his all-percussion ensemble M’Boom, and the double-quartet incorporating the string ensemble founded by his daughter, Maxine. It was one of the most delightful shows I’ve ever seen, and at the end, Roach walked onto the stage alone and played a solo on nothing more than a high-hat cymbal. He made it as engrossing as a solo played on a full drum kit, and if you don’t believe me, check it out here. He could improvise at tempos that would have most other drummers falling off their stools, but there was always something more than just athleticism going on when he played. Roach’s most famous work was the seminal We Insist! Freedom Now Suite, an uncompromising call-to-arms for the early years of the civil rights movement, but novices might be better off starting with the inviting, often dazzling work Roach recorded with Clifford Brown — a teamup tragically cut short by Brown’s death in an auto accident. The recordings with M’Boom are charming as well. A one-off trio session with Mingus and Duke Ellington in 1962 produced Money Jungle, one of my favorite albums from any of the three parties. Mingus and Roach were barely speaking during the session — Duke had to use all his diplomatic skills to keep Mingus from storming out — and the antagonism comes through on the title track and “Very Special.” But the album also includes “Fleurette Africaine,” a hauntingly beautiful melody created under conditions approaching spontaneous composition, and on other tracks the antagonism translates into challenge: unlike the session Duke recorded with John Coltrane, Money Jungle shows the venerable bandleader being pushed to his limits by the young turks. But that’s what great jazz is all about: not just individual musicians playing at their peak, but individual musicians pushing each other to their peaks. Roach shepherded some of the greats that way — as radical was We Insist! might have been, it still had room for old school saxophonist Coleman Hawkins, who spent the session looking at Roach and saying, “You wrote this? My my!” High praise indeed from a musician like the Hawk, and praise that Roach earned many times during a long and remarkable career. July was pretty dead for book appearances: the entire month should have been renamed “Property of J.K. Rowling.” Event organizers at bookstores could hardly think about anything that didn’t involve brooms and magic wands. But Saturday marked a return to the publicity circuit with a well-attended reading at the Barnes & Noble in Freehold. I do love to see a table in the front of the store piled high with copies of The Last Three Miles, and once the reading was over I had the pleasure of meeting several descendants of Teddy Brandle, the labor boss who figures in the story. Yesterday I learned that the distinguished essayist Lewis Lapham included The Last Three Miles on his quarterly list of recommended books, which was a welcome bolt from the blue. Next I’ll be appearing at the Spring Lake Public Library for a 7:30 p.m. reading on Monday, August 27. As you may know, Spring Lake is one of the prettiest towns along the Shore and has a population that tilts heavily toward Irish-American, so I expect Frank Hague will be the focus of interest. The bridge disaster in Minneapolis has refocused attention on the wretched state of our infrastructure, and the Freehold appearance was the first where the design of the Skyway itself prompted more questions than the politics and labor war that surrounded its construction. Though I don’t think the Skyway is going to collapse anytime soon, its design and construction offer a museum-quality example of how political interference can undo engineering work. Come on to the library on August 27 and I’ll be happy to tell you more.